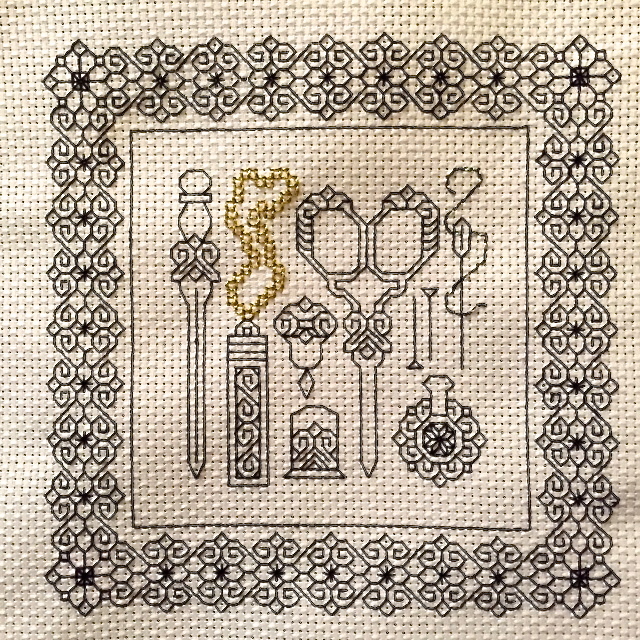 Last week a member of the blackwork embroidery group on Facebook shared her interpretation of this pattern and several other members then showed their full and partial pieces made from the same one. I figured I ought to join in. 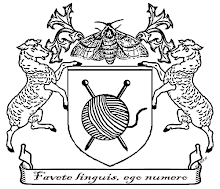 Blackwork has its roots in Elizabethan embellishments. It can be used to create decorative finished edgings on garments, or to create entire decorative pieces with assorted filling patterns. It's very versatile in look. 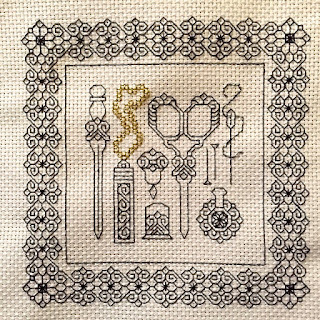 And while I often use the traditional black, many other modern stitchers enjoy using the very complete modern palette of embroidery floss colors, mixing and matching all sorts of rainbow hues and even variegated flosses. In this piece I used just the traditional black cotton floss for the majority of the work. I went ahead and used 3 strand gold floss for the needle case chain, and a silvery blending filament along with the black floss for the thread in the needle. Just a single strand of black 6 strand floss is used throughout; that's enough to stand out on the 14 count Aida cloth (14 count Aida or 28 count even weave are the most commonly used, though sometimes I've used 18 count; I wouldn't want to sentence my eyes to dealing with 36 count even weave cloth, Aida at least has more visible holes, though it's hard to find needles that are small enough for those holes but large enough to thread with a strand of embroidery floss). In any case, this is now ready to be framed. I think it needs black and gold mats and an Art Deco style frame of some kind. Love this Elise! It is just GORGEOUS!! !